During playback, press the [ ] button. • Goes to the next file whenever you press the button, if there are over 2 files in the disc. • Goes to the previous file whenever you press the button, if there are over 2 files in the disc. During playback, press the ( ) button. To play back the disc at a faster speed, press or button during playback. 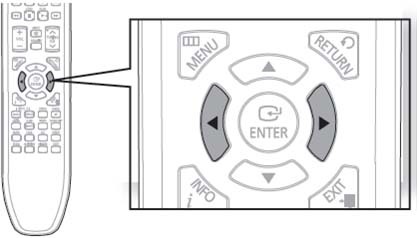 • Each time you press either button, the playback speed will change as follows: 2x ➞ 4x ➞ 8x ➞ 32x ➞Normal. During playback, press the Cursor , button. • Playback skips 5 minutes forward whenever you press the Cursor button. • Playback skips 5 minutes back whenever you press the Cursor button. • If there are multiple audio languages on a disc, you can toggle between them. • Each time you press the button, your selection will toggle between AUDIO (1/N, 2/N ...) and . ※Note: is displayed when there is only one supported language in the disc. • Each time you press the button, your selection will toggle between SUBTITLE (1/N, 2/N ...) and SUBTITLE OFF. • See number 2 (Caption Function) on the next page for more details concerning Subtitle usage with DivX discs. 1. In Stop mode, press the Cursor ▲,▼ button, select the desired subtitle ( ) from the TV screen, and then press the ENTER button. 2. When you select the desired DivX file from the TV screen, the movie will be played normally. DivX is a video file format developed by Microsoft and is based on MPEG4 compression technology to provide audio and video data over the Internet in real-time. MPEG4 is used for video encoding and MP3 for audio encoding so that the users can watch a movie at near DVD-quality video and audio. This product only supports the following media formats. If both video and audio formats are not supported, you may experience problems such as broken images or no sound. • Aspect Ratio: Although the default DivX resolution is 640x480pixels, this product supports up to 800x600 pixels. TV screen resolutions higher than 800 will not be supported. • To use the caption function, save the caption file (*.smi) in the same file name as that of the DivX media file (*.avi) within the same folder. • Up to 60 alphanumeric characters for the file name. How do I use CD ripping? 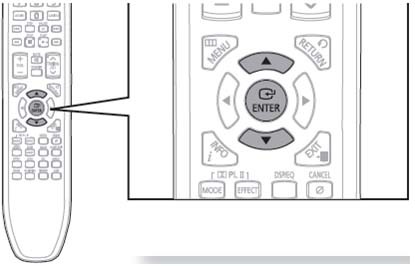 How do I set the Remote Control of my home cinema system?